It is a well known result in general topology that in any regular space with the countable chain condition, paracompactness and the Lindelof property are equivalent. The proof of this result hinges on one theorem about the spaces with the countable chain condition. In this post we are to put the spotlight on this theorem (Theorem 1 below) and then use it to prove a few results. These results indicate that in a space with the countable chain condition with some weaker covering property is either Lindelof or paracompact. This post is centered on a theorem about the CCC property (Theorem 1 and Theorem 1a below). So it can be considered as a continuation of a previous post on CCC called Some basic properties of spaces with countable chain condition. The results that are derived from Theorem 1 are also found in . But the theorem concerning CCC is only a small part of that paper among several other focuses. In this post, the exposition is to explain several interesting theorems that are derived from Theorem 1. One of the theorems is the statement that every locally compact metacompact perfectly normal space is paracompact, a theorem originally proved by Arhangelskii (see Theorem 11 below). All spaces under consideration are at least and regular. 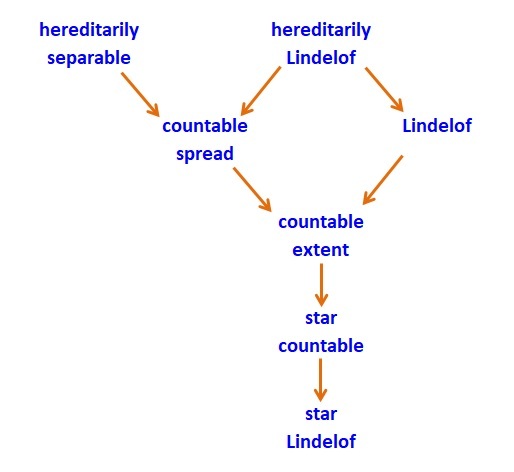 A space is said to have the countable chain condition (to have the CCC for short) if is a disjoint collection of non-empty open subsets of (meaning that for any with , we have ), then is countable. In other words, in a space with the CCC, there cannot be uncountably many pairwise disjoint non-empty open sets. For ease of making a statement or stating a result, if has the CCC, we also say that is a CCC space or is CCC. The theorem of CCC spaces we want to discuss has to do with collections of open sets that are “nice”. We first define what we mean by nice. Let be a collection of non-empty subsets of the space . The collection is said to be point-finite (point-countable) if each point of belongs to only finitely (countably) many sets in . Now we define what we mean by “nice” collection of open sets. The collection is said to be locally finite (locally countable) at a point if there exists an open set with such that meets at most finitely (countably) many sets in . The collection is said to be locally finite (locally countable) if it is locally finite (locally countable) at each . The property of being a separable space implies the CCC. The reverse is not true. However the CCC property is still a very strong property. The CCC property is equivalent to the property that if a collection of non-empty open sets is “nice” on a dense set of points, then the collection of open sets is a countable collection. The following is a precise statement. is dense in the open subspace , then must be countable. The collections of open sets in the above theorem do not have to be open covers. However, if they are open covers, the theorem can tie CCC spaces with some covering properties. As long as the space has the CCC, any open cover that is locally-countable on a dense set must be countable. Looking at it in the contrapositive angle, in a CCC space, any uncountable open cover is not locally-countable in some open set. Let be a collection of open subsets of such that the set as defined above is dense in the open subspace . We show that is countable. Suppose not. One observation we make is that for , if , then and . So the distinct are pairwise disjoint. Because the space has the CCC, there can be only countably many distinct open sets . Thus there can be only countably many distinct collections . Because the space is CCC, there are only countably many distinct collections in the above union. Each is countable. So is a countable collection of open sets. Furthermore, each contains at least one set in . From the way we choose sets in , we see that for each , for at most countably many . The argument indicates that we have a one-to-countable mapping from to . Thus the original collection must be countable. The property in Theorem 1 is actually equivalent to the CCC property. Just that the proof of Theorem 1 represents the hard direction that needs to be proved. Theorem 1 can be expanded to be the following theorem. Let be a space. Then the following conditions are equivalent. The space has the CCC. If is a collection of non-empty open subsets of such that is locally-countable at every point in the open subspace , then must be countable. The direction has been proved above. The directions and are straightforward. One easy application of Theorem 1 is to tie it to locally-finite and locally-countable open covers. We have the following theorem. In any CCC space, any locally-countable open cover must be countable. Thus any locally-finite open cover must also be countable. Theorem 2 gives the well known result that any CCC paracompact space is Lindelof (see Theorem 5 below). In fact, Theorem 2 gives the result that any CCC para-Lindelof space is Lindelof (see Theorem 6 below). A space is para-Lindelof if every open cover has a locally-countable open refinement. Can Theorem 2 hold for point-finite covers (or point-countable covers)? The answer is no (see Example 1 below). With the additional property of having a Baire space, we have the following theorem. In any Baire space with the CCC, any point-finite open cover must be countable. A Space is a Baire space if are dense open subsets of , then . For more information about Baire spaces, see this previous post. Let be a Baire space with the CCC. Let be a point-finite open cover of . Suppose that is uncountable. We show that this assumption with lead to a contradiction. Thus must be countable. Note that . Furthermore, each is a closed set in the space . Since is a Baire space, every non-empty open subset of is of second category (i.e. it cannot be a union of countably many closed and nowhere dense sets). Thus it cannot be that each is nowhere dense in . For some , is not nowhere dense. There must exist some open such that is dense in . Because is closed, . Choose . The point is in at most open sets in . Let such that . Clearly . Let . Note that . Every point in belongs to at most many sets in and already belong to sets in . So each point in can belong to at most additional open sets in . Consider the case and the case . We show that each case leads to a contradiction. Suppose that . Then each point of can only meet open sets in , namely . This contradicts that is not locally-countable at points in . Each element of is an open subset of that is the intersection of exactly many open sets in . So is a collection of pairwise disjoint open sets. The open set as a topological space has the CCC. So is at most countable. Thus the open set meets at most countably many open sets in , contradicting that is not locally-countable at points in . Both cases and lead to contradiction. So must be countable. The proof to Theorem 3 is completed. As a corollary to Theorem 3, we have the result that every Baire CCC metacompact space is Lindelof. is finite (countable). The proof of the following theorem can be found in Engleking (see the direction (iv) implies (i) in the proof of Theorem 5.3.10 on page 326 in ). If every open cover of a regular space has a star-countable open refinement, then is paracompact. As indicated in the above section, Theorem 2 and Theorem 3 have some obvious applications. We have the following theorems. Let be a CCC space. Then is paracompact if and only of is Lindelof. The direction follows from the fact that any regular Lindelof space is paracompact. The direction follows from Theorem 2. Every CCC para-Lindelof space is Lindelof. This also follows from Theorem 2. Every Baire CCC metacompact space is Lindelof. Let be a Baire CCC metacompact space. Let be an open cover of . By metacompactness, let be a point-finite open refinement of . By Theorem 3, must be countable. Every Baire CCC hereditarily metacompact space is hereditarily Lindelof. Let be a Baire CCC hereditarily metacompact space. To show that is hereditarily Lindelof, it suffices to show that every non-empty open subset is Lindelof. Let be open. Then has the CCC and is also metacompact. Being a Baire space is hereditary with respect to open subspaces. So is a Baire space too. By Theorem 7, is Lindelof. Every locally CCC regular para-Lindelof space is paracompact. A space is locally CCC if every point has an open neighborhood that has the CCC. Let be a regular space that is locally CCC and para-Lindelof. Let be an open cover of . Using the locally CCC assumption and by taking a refinement of if necessary, we can assume that each open set in has the CCC. By the para-Lindelof assumption, let be a locally-countable open refinement of . So each open set in has the CCC too. which is is open cover of . Within the subspace , is a locally-countable open cover. By Theorem 2, must be countable. The collection represents all the open sets in that have non-empty intersection with . Thus only countably many open sets in can meet . So is a star-countable open refinement of . By Theorem 4, is paracompact. Every locally CCC regular metacompact Baire space is paracompact. Let be a regular space that is locally CCC and is a metacompact Baire space. Let be an open cover of . Using the locally CCC assumption and by taking a refinement of if necessary, we can assume that each open set in has the CCC. By the metacompact assumption, let be a point-finite open refinement of . So each open set in has the CCC too. Each open set in is also a Baire space. which is is open cover of . Within the subspace , is a point-finite open cover. By Theorem 3, must be countable. The collection represents all the open sets in that have non-empty intersection with . Thus only countably many open sets in can meet . So is a star-countable open refinement of . By Theorem 4, is paracompact. Every locally compact metacompact perfectly normal space is paracompact. Any locally compact space is a Baire space. Any perfect locally compact space is locally CCC. To see the first point, let be a locally compact space. Let be dense open sets in . Let and let be open such that and is compact. We show that contains a point that belongs to all . Let , which is open and non-empty. Next choose non-empty open such that and . Next choose non-empty open such that and . Continue in this manner, we have a sequence of open sets such that for each , and is compact. The intersection of all the is non-empty. The points in the intersection must belong to each . To see the second point, let be a locally compact space such that every closed set is a -set. Suppose that is not locally CCC at . Let be open such that and is compact. Then must not have the CCC. Let be a pairwise disjoint collection of open subsets of . Let and let . Let where each is open in and for each integer . For each , pick . For each , there is some integer such that . So there must exist some integer such that is uncountable. The set is an infinite subset of the compact set . So has a limit point, say (also called cluster point). Clearly . So . In particular, . Then contains some points of . But for any , , a contradiction. So must be locally CCC at each . i.e, the product space of many copies of the two-point discrete space . Let be the set of all points such that for only finitely many . Then is a point-finite open cover of . Of course, in this example is not a Baire space. The following three examples center around the four properties in Theorem 7 (Baire + CCC + metacompact imply Lindelof). These examples show that each property in the hypothesis is crucial. A separable non-Lindelof space that is a Baire space. This example shows that the metacompact assumption is crucial for Theorem 7. The example is the Sorgenfrey plane where is the real line with the Sorgenfrey topology (generated by the half-open intervals of the form ). It is well known that is not Lindelof. The Sorgenfrey plane is Baire and is separable (hence CCC). Furthermore, is not metacompact (if it were, it would be Lindelof by Theorem 7). A non-Lindelof metacompact Baire space . This example shows that the CCC assumption in Theorem 7 is necessary. This space is the subspace of Bing’s Example G that has finite support (defined and discussed in the post A subspace of Bing’s example G. It is normal and not collectionwise normal (hence cannot be Lindelof) and metacompact. The space does not have CCC since it has uncountably many isolated points. Any space with a dense set of isolated points is a Baire space. Thus the space is also a Baire space. A non-Lindelof CCC metacompact non-Baire space . This example shows that the Baire space assumption in Theorem 7 is necessary. Let be the set of all non-empty finite subsets of the real line with the Pixley-Roy topology. Note that is non-Lindelof and has the CCC and is metacompact. Of course it is not Baire. For more information on Pixley-Roy spaces, see the post called Pixley-Roy hyperspaces. For the purpose of this example, the Pixley-Roy space can be built on any uncountable separable metrizable space. Tall, F. D., The Countable Chain Condition Versus Separability – Applications of Martin’s Axiom, Gen. Top. Appl., 4, 315-339, 1974.